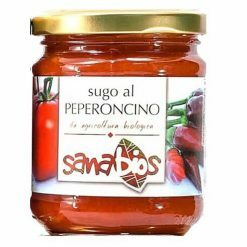 Organic pasta sauce – peperoncino. This delicious, home-made style pasta sauce is made in a traditional Italian way, close to Torino. It uses organic San Marzano tomatoes, organic chilli, and other organic vegetables, for a truly authentic, Italian pasta sauce with just the right level of spiciness. Ingredients: Organic tomato sauce, organic celery, organic carrots, organic onions, organic extra virgin olive oil, salt, organic chilli.